It's Back-To-School Week at Little Birdie Secrets! I know, I keep complaining about summer being over, but I have to admit I love getting ready for a new school year. All the back-to-school supplies, new clothes--you'd forget my son's only in preschool with the way I carry on. To make the transition from summer fun to school days a little easier (for me), we thought it'd be fun to showcase some fabulous back to school accessories you can create to make going back to school exciting for your little munchkins (and the big ones, too). And if you put the Little Birdies link on your own blog and leave us a comment this week, we'll enter you in our giveaway! (Don't forget to give us your blog address!) You could win something from every post this week! Wahoo! For our first back-to-school idea, we wanted to showcase a couple of easy, fun notebooks we dressed up a little. There are so many cute notebooks out there these days, but you can easily take them from cute to stunning with a little ribbon. 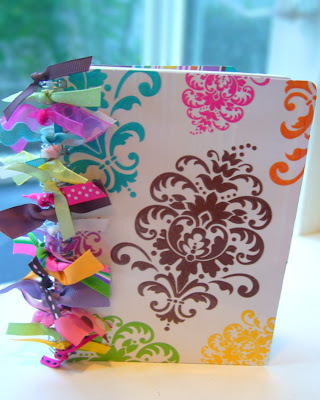 Most of the ribbon on this notebook came from scraps I'd saved from gifts or cards. Don't be afraid to include funky colors and prints you might not think match. The more ribbon the better! Don't forget to apply a little Fray Check to the cut edges to avoid major fraying. Our second featured notebook is a simple composition book (we found it at Target for $.50) covered with patterned paper and a little ribbon. Your child will never have to ask to borrow a pen or pencil again with this clever design. (We scraplifted this idea from a Close To My Heart ad.) Plus those mini pens and pencils are adorable. Cut a piece of cardstock to fit the front, back, pen area, and spine of your composition book. Glue all pieces on using the adhesive of your choice (we like Mod Podge, but be sure to smooth out all the bubbles with a brayer or bone folder). Lightly sand the edges of the paper so it "becomes one" with the notebook cover. We zigzag stitched along the seam through the paper and cover with a sewing machine just for fun. Cut a piece of ribbon long enough to wrap around and tie a bow, plus a little extra for the pen loops. Zigzag stitch the ribbon in measured spaces to accomodate pens and pencils (be sure to use the pen or pencil as a guide so it's the right size). Secure the rest of the ribbon to the book with a little MonoAdhesive or double-sized tape so it doesn't slip off. We used a Crop-A-Dile to punch two holes in the cover and place large eyelets at the top. Then we tied a little ribbon through them and attached a scrap of paper with a stylish paperclip. This would be so cute with the owners name on it instead of "notes." I don't know about you, but I'm ready to take some notes. Some fabulous notes. Don't forget to visit us again tomorrow for another back-to-school project, and to enter our giveaway! oh yay, I LOVE giveaways! And I love these notebooks. I can't wait to make some for my daughter, Ally, who is starting kindergarten, PERFECT!!!! I love school supplies! I just gave a shout out to these adorable notebooks at my blog! Beautiful!! A couple weeks ago, I posted about a mini notebook that I covered, but it surely doesn't compare to these amazing creations! What amazing talents you have! Darling notebooks. Do I score extra points if I already had my site (www.ticklingshadows.blogspot.com) linked to yours? We have a mutual friend (Bonnie) who led me to your site. Love all your fun creative ideas! What a great way to use up all of that extra ribbon sitting around the house. Super cute ideas. Thanks for sharing. I LOVE your blog and all of the super cute ideas!! You girls are so creative! I have been passing your site along to all of my crafty friends:) Everyone loves it! Thanks for all of the fun ideas! Very cute. I love the little ribbon pen holder idea. You have such cute ideas and everything is totally do-able, even for us not-so-crafty people! Jessica just showed us some of the projects you have made- so cute!! I have added a link on my blog. The address is: http://cabndrice.blogspot.com. I can't believe how creative you ladies are! These are really cute! Such cute notebooks, I've got to make my little girly girl a few of these! Thanks! All these adorable notebooks make ME want to go back to school! These are great! I love the composition notebook idea - per my previous comment, I bouth four before I realized they weren't on the *Revised* school supply list after all, so glad I have some ideas to use them up now!! Last comment - for now. I'm just going to subscribe and save myself the trouble of trying to catch up on everything at once!! Those are so beautiful! I can't wait to make some. It would be great for Christmas and Birthday.Love your ideas! !